Back when I was in Middle School, my mom decided to go back to school herself and earn her Master’s Degree. She made a living by teaching art to rowdy 6-12th graders at the local public school, but had always aspired to teach at the college level. I remember the work she put in to teaching all day, then attending classes (when did she do that?! ), only to come home to HOMEWORK (plus laundry…dinner…the usual)! She would stay up half the night finishing a painting, a sculpture or a paper. It was then that she began this heron weaving project. As magnificent as my mom is at painting and drawing, her passion is fibers – quilting, sewing, creating fabric from yarn on her loom. So what better subject to practice on than your favorite animal, right? For her, the Great Blue Heron has been her inspiration for as long as I can remember. This majestic bird has captured her attention and left her in AWE. So, she began to create this woven heron, looking off the right, with both feet in the ocean, the clouds and the vast ocean in the background. The project wasn’t required for class, so by default hung unfinished in the guest bedroom of my house growing up as long as I was there, and then moved to their new home in Arkansas, with the hopes of one day being completed. I am one of those people who love a finished project and I always inquired of mom what this piece would look like – I always loved it. A few years ago on one of her visits, she brought me a gift. 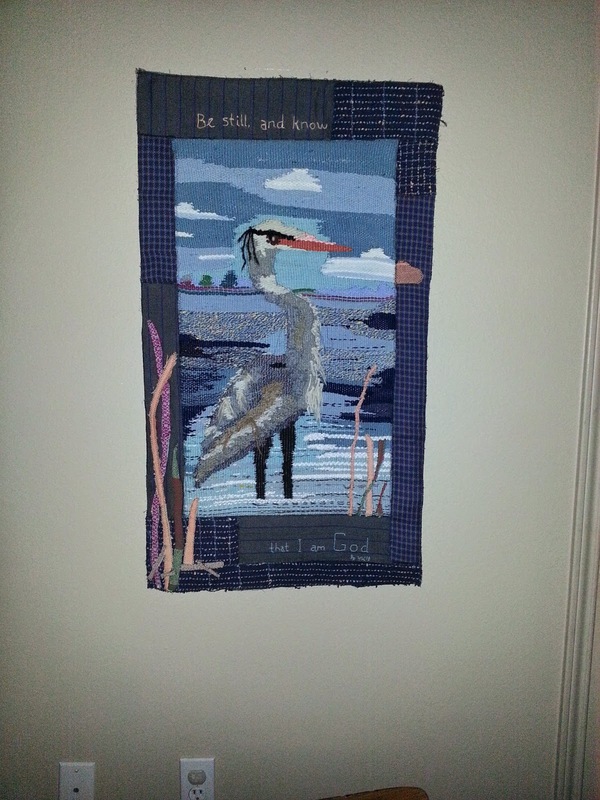 Unwrapping the paper, I discovered it was this heron piece, now completely finished and transformed into a quilt to hang on my wall, decorated with borders of familiar fabric and the scripture, “Be still and know that I am God.” I loved it and immediately hung it on the wall. 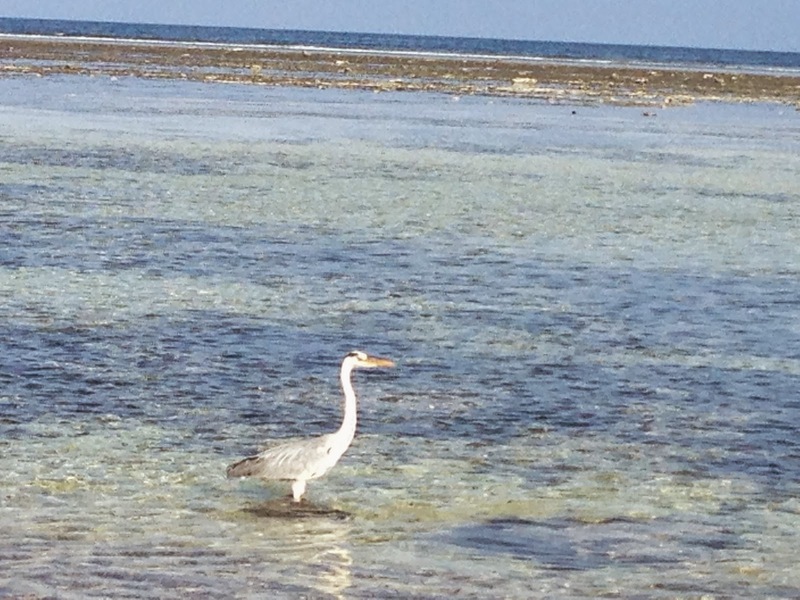 Now, back in Africa, while Maggie and I were sun-bathing on the beach, what do ya know but a heron flies by and lands in the water just ahead, perfectly poised for a photo. I grab Maggie’s phone to try and steal a shot for my mom. I took a picture about every step thinking he would fly away at any moment. But he stayed perfectly still, not moving a muscle, so I got several amazing, close up shots. It was as if he wanted me to capture this moment. I emailed one picture to my mom saying this was confirmation she was to join me here sometime. When I got home, I lay on my couch, exhausted and jet lagged. I looked up at the heron quilt on my the wall facing me, and then it hit me…that Deja Vu feeling that I’d seen this before, and RECENTLY. I pulled up the picture on my phone to compare the two images. Yep, the quilt my mom started over 20 years ago, looked like she had created it while looking at the picture on my phone that I’d taken only 5 days earlier. Down to the detail, this picture depicted the quilt and raised the hairs on my arm. That’s what Kenya this year was about – confirmation that what God began many years ago, He will finish in His time. He knew I would one day walk the beach of Kenya’s south coast – that I would travel there when everything around me said it was unsafe. He confirmed again my steps were directed by Him and He had a plan for me there! So this leaves me with a question…how does God confirm His will to me, to you, to us as His people? Earlier this year, the Lord overflowed my heart with words for a ladies conference. I wrote and wrote, prayed, and re-wrote, wondering what this material was for. When the Ladies Conference this year in Kenya was cancelled, I wondered why God had laid these words on my heart and if they held any relevance to the people of Kenya at all. However, when I got there and talked with some ladies about what they would love to see and hear at a ladies conference, it confirmed what God placed on my heart. SO I want to encourage you, readers and friends with this: Listen. The Spirit of God is living and active in our hearts and minds. He whispers to us and lays certain things on our hearts that we may not understand why at the time. But He has a time and a place for it. Sometimes, His timing may look to others as silly, unsafe, rebellious, or radical – but LISTEN and follow wherever He leads you!!! !